John’s gospel starts with a bang. It begins with the wonderful Prologue, the hymn to the Word: ‘In the beginning was the Word and the Word was with God and the Word was God’. There’s no infancy story in John’s gospel, the narrative of Jesus’ life and ministry starts with the testimony of John the Baptist; the recognition by John of Jesus as the Lamb of God; and then Jesus’ calling of his first disciples. We have the first miracle at Cana, and then the cleansing of the Temple, which John places at the beginning of Jesus’ ministry rather than at the end. Now we come to today’s reading. Many people believe in Jesus because of the signs that he’s done and one of them, Nicodemus, comes to visit Jesus at night. Why at night? Is he trying to hide what he’s doing, sneaking away from the other Pharisees, the Jews of whom he’s a leader? Or is he coming to visit a teacher in the quiet hours, when Pharisees were advised to study without the distractions of the day? Or is the night from which Nicodemus emerges to question Jesus symbolic, representing the world of evil and ignorance into which the light that is Jesus has come to shine? Given that we’re reading a story written by John, probably all three answers are right. Emerging from the night, Nicodemus seeks Jesus, the light that shines in the darkness, and tells Jesus that he recognises him as one of the great figures of Israel, a teacher from God. It is probable that Nicodemus, like the many others who saw Jesus in Jerusalem at Passover, believes in Jesus because of the signs Jesus has done. But we are told that Jesus did not entrust himself to these people, because he knew what was in their hearts. Believing in God because of ‘miracles’ isn’t a firm basis for faith. As we know, those who acclaimed Jesus were equally ready to condemn him. Nicodemus has addressed Jesus as ‘Teacher’, and Jesus is about to teach him that belief because of signs and wonders is not enough. Being ‘wowed’ by miracles is not that same as living life in Christ. Jesus answers Nicodemus: ‘Very truly, I tell you, no one can see the kingdom of God without being born from above.’ In Greek, the same word can mean ‘again’ and ‘from above’, and Nicodemus takes the first meaning and retorts: ‘How can anyone be born after having grown old? Can one enter a second time into the mother’s womb and be born?’ His questions might not be meant aggressively, it might just be a genuine misunderstanding. After all, while we have some idea of what the phrase ‘born again’ might mean, and understand that it doesn’t involve literally re-entering the womb, Nicodemus doesn’t have the benefit of our knowledge of 2000 years of Christian history. On the other hand, it could be that Nicodemus does have a sense of what being born again or born from above might mean, and wants to avoid its implications. If someone is born again, then presumably they will also grow up again. Their lives will change. Those things that seemed important to them might lose their significance. And they themselves will lose their own authority; the things that gave them standing in the world will be meaningless. A re-born Nicodemus might not ‘grow up’ to be a Pharisee and leader of the Jews. Even as a Pharisee and a leader of the Jews he would have no more importance in God’s kingdom than the youngest child, the most marginalised woman. Maybe Nicodemus senses this and is resisting it. Maybe he asks his question not because he takes Jesus literally, but because he’s playing for time, as he thinks about what Jesus is suggesting. Being born from above. Being born again. What does it mean? ‘Very truly, I tell you, no one can enter the kingdom of God without being born of water and Spirit.’ For us, again with that advantage over Nicodemus of 2000 years of Christian history, the idea of being born of water and the Spirit instantly makes us think of baptism. When we are baptised we die and are reborn; the font is both tomb and womb. John the Baptist said that while he baptised with water, Jesus would baptise with the Holy Spirit. 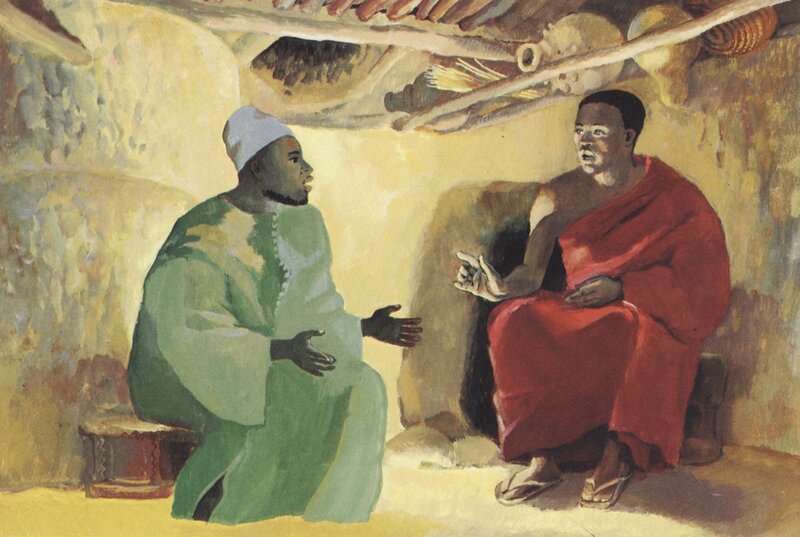 As Jesus tells Nicodemus, the Spirit is not to be controlled by humans. Like the wind, the Spirit blows where it chooses, and we don’t know where it comes from or where it goes. None of us were in charge of our first births; we didn’t choose our parents or where and when we were born. The fact that we were born at all was decided by other people. In the same way, it’s God who is in charge of our being born from above. We’re baptised at God’s invitation; it is God who initiates baptism. The Spirit blows where it will; all we can do is seek to be open to its coming. ‘What is born of the flesh is flesh, and what is born of the Spirit is spirit. *’ For John, unlike Paul, flesh is not sinful. After all, John wrote that the Word itself became flesh. For John, flesh is merely weakness and mortality. We are all born of the flesh; to remain born only of the flesh is to remain content with what we can see and know with our senses. It is to have the sort of faith that Nicodemus has when he first approaches Jesus – a faith based on signs and wonders and miracles. Those who believe according to the flesh, believing on the basis of signs and miracles, would see Jesus’ crucifixion as tragedy, as failure. But for John, for those who believe according to the Spirit, the crucifixion is simultaneously Jesus’ death and his glorification. ‘Just as Moses lifted up the serpent in the wilderness, so must the Son of Man be lifted up, that whoever believes in him may have eternal life.’ Jesus will be lifted up on the cross both physically and in glory as he obeys the Father and ascends on the cross. Jesus is the revelation of God, and that revelation will reach its highpoint on the cross. To be born of the Spirit means to see in the pain and squalor of the crucifixion the ultimate revelation of God. ‘For God so loved the world that he gave his only Son, so that everyone who believes in him may not perish but may have eternal life.’ Those who believe in Jesus will have eternal life, they are born from above. They are not merely born again and from above, they live again, grow up again, live new and different lives that develop from their new birth. Their belief in Jesus is not just the sort of intellectual recognition that Nicodemus shows: ‘Rabbi, we know that you are a teacher who has come from God’. Their belief in Jesus changes their entire lives, recognising that God is love, that in Jesus God is showing how much God loves the world, and that because of that love they are called to live lives of love for one another. Being born from above, being born again, changes the way that people live their lives. Believing in Jesus intellectually is not enough – it is how lives are lived out that shows whether that belief has come from the heart. God is love. God so loved the world. We love, because God first loved us. Love one another, as I have loved you. This is Jesus’ revelation of the nature of God, seen most clearly in Jesus’ death on the cross, where the Son of Man is lifted up. We are human, mortal, born of the flesh as well as of the Spirit. Despite being born from above, we often fail to live up to our new birth. Luckily for us, ‘God did not send the Son into the world to condemn the world, but in order that the world might be saved through him’. By the grace of God our faults and failings are forgiven. Lent, these forty days of penitence and preparation, give us time to reflect on ways in which we are living lives unworthy of our new birth, and to repent, to turn again to God. This is the purpose of the season of Lent. But all our preparation and repentance is done in the sure and certain knowledge of God’s great love. As we journey towards Easter, we journey in the knowledge that we are loved by God, who sent his Son to save the world, not to condemn it. Thanks be to God. Amen. This entry was posted in Sermons and tagged being born again, John 3:1-17, Sermon, Year of Matthew. Bookmark the permalink.